Something extraordinary just took place in Russia and it may have moved our disturbed world one major step nearer to peace and away from a looming new world war. Of all unlikely things, what took place was a nationwide remembrance by Russians of the estimated 27 to perhaps 30 million Soviet citizens who never returned alive from World War II. 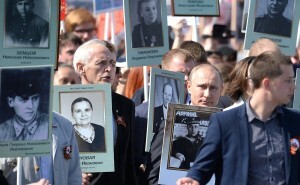 Yet in what can only be described in a spiritual manner, the events of May 9, Victory Day over Nazism, that took place across all Russia, transcended the specific day of memory on the 70th anniversary of the end of World War II in 1945. It was possible to see a spirit emerge from the moving events unlike anything this author has ever witnessed in his life. The military part of the events also featured for the first time ever elite soldiers from China’s Peoples’ Liberation Army marching in formation along with Russian soldiers. That in itself should [send] shivers down the spines of the neoconservative warhawks in the EU and Washington, had they any spines to shiver. The alliance between the two great Eurasian powers—Russia and China—is evolving with stunning speed into a new [alliance] that will change the economic dynamic of our world from one of debt, depression, and wars to one of rising general prosperity and development if we are good enough to help make it happen. The two great Eurasian countries have now cemented the huge oil and gas deals between them, the trade deals and the military cooperation agreements with a commitment to fully integrate their economic infrastructure. Following his meeting with Xi, Putin told the press, “The integration of the Eurasian Economic Union and Silk Road projects means reaching a new level of partnership and actually implies a common economic space on the continent.” ……. My tears at seeing the silent marchers and at seeing Putin amid them was an unconscious reaction to what, on reflection, I realized was my very personal sense of recognition how remote from anything comparable in my own country, the United States of America, such a memorial march in peace and serenity would be today. There were no “victory” marches after US troops destroyed Iraq; no victory marches after Afghanistan; no victory marches after Libya. Americans today have nothing other than wars of death and destruction to commemorate and veterans coming home with traumas and radiation poisonings that are ignored by their own government…. AMERICANS, WE MUST LEARN TO DISCERN TRUTH FOR OURSELVES! In his speech to the assembled troops and veterans, President Vladimir Putin said that the carnage of the war underlined the importance of international co-operation, but “in the past decades we have seen attempts to create a unipolar world.” That phrase is often used by Russia to criticize the United States’ purported aim to dominate world affairs. Note how the Western Media turns Russia’s Victory Day Celebration into propaganda portraying Putin’s Russia as our enemy. This reporting is in sharp contrast to the above article by an American journalist who wept for America while witnessing Russia’s Victory Day Celebration. In short, Canadian TV NEWS, among the other mainstream Western Media, slants their reporting to create negative impressions toward those leaders and nations that stand in the way of the Khazarian Mafia’s interests. The people of North America need to wake up to this fact. Little do we appear to recognize that the majority of Earth’s population is actively moving toward creating a peaceful, prosperous world while the North American continent lags behind, as the KM attempt, instead, to instigate WWIII. American citizens may not want WWIII, but—as the American Journalist, F. Willian Engdahl, implied: We allow these efforts to continue.